Featured: After the Challenge, DogSplendor Believes in Fresh for All! This past week I’ve been sharing insights from my participation in the Freshpet Fridge Challenge. The challenge was established to bring attention to the importance of fresh foods in your dog’s diet. And while my dogs didn’t go without fresh food for the length of this challenge, I did, and let me just say, it really drove home the importance of fresh for all! To learn more about DogSplendor and their Fridge Challenge week, be sure to view their website here. Hi there. Checking in on day five of my one week Freshpet Fridge Challenge. If you haven’t already, make sure you read my post on how this all got started, I’ll wait. Ok, welcome back. So…let’s just say Freshpet didn’t call it a “challenge” for nothing! As someone who tries to eat healthier (most of the time), I really didn’t realize how much I depended on my refrigerator. Here are just a few of the things I’ve noticed this week: Inconvenience. These days when I shop, as much as possible, I like to load up on fresh veggies, fruits, meats, frozen items, etc. And I’m a big fan of cooking in batches for less effort later in the week. Well, without a fridge the above scenario isn’t that possible. I did try shopping right before cooking a meal, but that is inconvenient and buying in small quantities is hard as I’m only cooking for two people. Throwing away ingredients or leftovers because they can’t be chilled seems so wasteful. After all, I was brought up being told by my mama that there were starving children in Ethiopia! Carbs! Oh holy jeez, a lot of carbs! A lot of the shelf-stable ingredients are carbohydrates, such as pasta, rice, oatmeal, etc. Don’t get me wrong, carbs are tasty! But eating a lot of carbs for meals this week has left me feeling not so great. An average day has been oatmeal for breakfast, soups (with more carbs than protein) for lunch, pasta with jarred sauce for dinner, etc. As a result of all the extra carbs, and quite possibly the additional salt in these products, I’ve noticed headaches a few days in a row now. Making items shelf stable involves some nasty additives. For example, I’m used to having eggs in the morning. Is there a shelf stable alternative? Yep. Powdered eggs. They have a shelf life of about three years (ewww!) and include an “anti-caking” agent (who is anti-cake!?). Milk for my coffee? Yep, a powdered version exists. It has four times the ingredients of fresh milk and has been fortified (meaning the original nutritional properties were lost in processing, and re-added afterwards). Again, it has a shelf life of a bazillion years, which is pretty scary. And we won’t even talk about most proteins. With the exception of tuna fish, not many shelf-stable proteins seem that appetizing, and even tuna needs refrigerated mayo to make it palatable. And any protein that becomes shelf stable involves a lot of sodium in the process. So what does this mean for my dogs? I’ve realized quite a few things this week about my dog’s nutrition, the convenience factor, and how I’d like their diet to be a bit more fresh. At the conclusion of my seven day challenge, I will be posting my insights on pet nutrition that have resulted from my personal fridge-less experiment. Come back and join me on Tuesday, October 1st! This post has a Disclosure Level of 9. To learn more about DogSplendor and their Fridge Challenge week, be sure to view their website here. 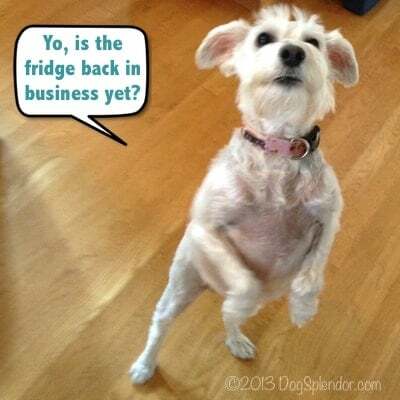 DogSplendor is a participant in the Freshpet Fridge Challenge. For the next seven days, you can follow DogSplendor's experience of life without the fridge right here on the Fridge Challenge website. Or, you can read all about it on the DogSplendor website here. Lastly, to catch every bit of DogSplendor's week without the fridge, be sure to follow DogSplendor on Facebook and Twitter here. The following was written by Stefanie, author of DogSplendor: In honor of National Pet Obesity Month coming up in October, this week I’m taking part in the Freshpet Fridge Challenge, which helps promote the importance of fresh food for the health of dogs and their humans. So, as of yesterday, and for the next week, I’ll be living without the use of my refrigerator. Stay tuned for updates on how the ability to keep things fresh might affect us all, and insights on why fresh food is equally as important for you and your pups. It’s odd how it took me until at least my 30s to truly pay close attention to the correlation between food and fueling my body. In my 20s, I’d make due with whatever was in the cupboard; it might be Top Ramen, it might be some cheap canned soup, a box of day glo orange mac and cheese, or some margarita mix. Frankly, you guys, I’m surprised I survived my 20s. In my 30s and 40s I started paying attention to what food did to my body as its fuel. How I felt eating certain things versus others. And I can tell you, highly processed, shelf-stable items were no longer the norm. Those items were replaced with a variety of fresh produce, fresh proteins, some frozen items, and taking the time to prepare meals from a combination thereof. Increasing the number of fresher items and decreasing the amount of preservatives and chemicals, made a difference in my diet and health. But I’m not saying fresh is easy. At times the convenience of processed food wins out over taking the time to make a healthier meal. Sometimes I’ve wished there were human kibble – that I could pour a big bowl of kibble for the husband and he’d get as excited as the dogs do over theirs. That would be sweet. I’m going to have to get creative with meal planning if I want to keep it healthy. Sure it would be easy to eat out at every meal, but I know from experience on vacations how that can make you feel sluggish and bloated. No fun. Not to mention the dent in your pocketbook. Yesterday I headed to our local co-op market to see what I could find for this week. I managed to find a few healthier soup options, and some fruits and veggies that didn’t require the fridge. The ingredients for last night’s dinner were bought at the store, and brought home and cooked immediately. There was no option to keep leftovers. This morning I had to go to that coffee giant with the green mermaid to get my coffee with some fresh milk in it. Not so convenient, and I couldn’t sit around in my jammies with my coffee as I usually do. The positive so far? I’m glad I live in Washington state and apples are in season - because I’ve had three since this challenge began. If an apple a day keeps the doctor away, I should be good for a bit. This post has a Disclosure Level of 9. Additionally, my dog’s meals are exempt from the “rules” of this challenge.